Time and again in the Gospels we see Jesus turning the accepted wisdom of the people of God upside down. He challenged the Sabbath orthodoxy by insisting that doing good works is no violation of God’s commands. He touched lepers to show that there are no untouchables in God’s Kingdom. He calmed a murderous crowd ready to stone an adulterous woman by forcing them to look at their own guiltiness and need for God’s mercy. Following Jesus’ example, the church, too, has often stood against the accepted wisdom of our day — for instance, by opposing slavery and racial injustice, or in the growing movement to end human trafficking. Sometimes we lead, sometimes we follow, and sometimes we’re asleep. In any given year, more than 25% of American adults are suffering from some form of mental illness, such as depression, PTSD, OCD, ADHD, bipolar disease, schizophrenia… Men and women suffering from debilitating mental illnesses are in our pews every Sunday, but the church doesn’t talk about it. Why is that, and what sort of message does it send? Frankly, I don’t think most Christians know what to think about the emotional pain of mental illness, except that it scares them. Christianity talks so much about joy, peace, hope, and becoming new creations in Christ, I think it’s difficult for us as a church to know what sort of theology could embrace people who live in confusion, who are racked by emotional distress, who are driven by obsessions or anxiety or who feel overwhelmed by despair. As a longtime sufferer of depression, I can tell you that the church’s silence about mental illness has often left me with the impression that everyone has it together except me. Silence leads those who suffer in silence to question their faith, to wonder if they’ve been singled out for punishment, to wonder if the resurrected Christ has any power over the darkness that can inhabit our minds. I’ve just read Amy Simpson’s powerful and informative new book on mental illness, and it has given me hope that the church may be ready to have this long overdue conversation about the stigma and shame so many mentally ill Christians and their loved ones live under. 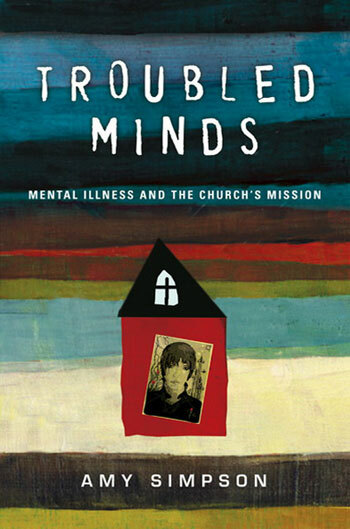 Troubled Minds: Mental Illness and the Church’s Mission is full of hope and encouragement for the mentally ill, and straight talk to pastors, church leaders and ordinary Christians about how the church, with a few notable exceptions, has too often failed to help. Troubled Minds is a book full of heartbreak, but also full of Christ’s grace and redemption. Through interviews with sufferers, Simpson shows firsthand the terrible ways that Adam’s sin has the power to break our minds. Through interviews with pastors, she describes the many barriers the church faces as it tries to help, and our country’s broken approach to mental illness treatment, healthcare that is expensive, confusing, and too often satisfied with short-term gains when dealing with what can be lifelong problems. But despite these obstacles, Simpson has found a few churches who are investing themselves in providing support and practical help for the mentally ill and their families. She describes these ministries in some detail, with the obvious hope that other churches will go and do likewise. Tying together all of this meticulous research and compelling firsthand accounts is Amy Simpson’s own heartbreaking story of her life with a mother who suffers from schizophrenia. Simpson and her siblings always knew their mother was different, but it wasn’t until Amy was 14, when her mother had her first psychotic break with reality, that the family began to glimpse the depths of the problem. Simpson goes on to describe her mother’s tragic downward spiral through hospitalizations, imprisonment, medication trial and error, and long periods when her mother was home with the family but barely functioning, heavily dependent on the rest of the family for care. Amy Simpson’s father was a pastor. Her family was raised in the church. Prior to the onset of her mother’s schizophrenia, Simpson’s family seemed as ordinary as any American Christian family could be. But once her mother’s illness showed itself, her care and treatment became the consuming focus of every day for every member of the family. But when it comes to supporting those who are dealing with mental illness, the church is often at a loss to know how to help. After referring such people to psychological doctors and counselors, is there more that can be, should be, done? When I have been in the throes of depression, my instinct has been to hide it from others. I didn’t want to appear weak or needy — this, despite Paul’s declaration in 2 Cor 12:9 that God shows his power in our weakness. I was also afraid of condemnation. Lord knows I was already heaping boatloads of condemnation on myself, feeling certain that I had failed God, failed the church, that my faith must be a sham. Those who suffer from mental illnesses are often afraid or ashamed to talk about it openly, and if they did, would we be prepared to listen compassionately, to pray effectively, to look for ways to help them carry this awful burden? Those are some of the questions the church needs to answer. How do we help carry the burdens of those among us who suffer from mental illness? Amy Simpson’s Troubled Minds offers a great many practical insights to help us answer that question. It’s an important book, and I think Simpson has written it at a time when the church is ready to have this conversation. The mission of the church of Jesus Christ is to take the light and hope of the risen Christ to those who live in darkness. There is the darkness that comes from ignorance of God’s love, and a darkness that is biological, that attacks our minds and permeates our souls. This is no spiritual failing but a very physical symptom of the brokenness we see in all of creation, both outwardly in our crumbling world, and inwardly in our crumbling bodies and minds. 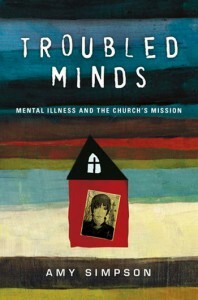 Troubled Minds is a must-read book for any pastor or church leader who is ready to take a serious look at how the church might minister to the mentally ill. For sufferers of mental illness, their families and friends, Troubled Minds is a book full of hope, a book that doesn’t pull any punches but leads constantly back to Jesus as the only solid ground on which we can stand when troubles assail us from the outside or from within. I highly recommend it. You can listen to Amy Simpson tell her story in her own words in this short video. Thanks for this, Charlie, I’ve forwarded to my friend who suffers from multiple mental health incapacities and diagnoses, with whom we have often discussed the difficulties of even beginning to engage particularly Pentecostal Christians (our own tradition in other words), with regard to such realities. I will also look into getting a copy of this text. Blessings of shalom, to you, Charlie.